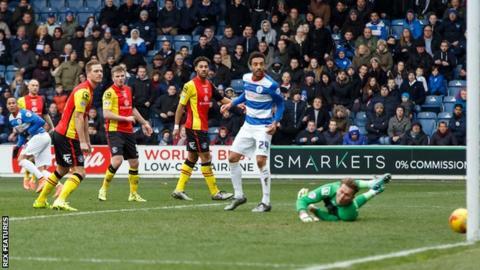 A dominant QPR won for the first time in four games to land a blow to Birmingham City's play-off hopes. Tjaronn Chery scored the first, drilling the ball low in to the corner after good work from James Perch. Junior Hoilett capped off an excellent first half for Rangers when he converted a penalty after Sebastian Polter was fouled by Michael Morrison. Massimo Luongo, Gabriele Angella and Chery all forced good saves from Tomasz Kuszczak after the break. Birmingham, who drop to eighth in the Championship table, failed to trouble the home side in the first half, and only went close twice after the interval. Jonathan Grounds had a shot headed over the bar by Karl Henry, while Clayton Donaldson saw an effort deflected over 12 minutes from time. Cardiff's win over Preston means Birmingham are five points off Sheffield Wednesday, who occupy the final play-off place. The victory was just QPR's third since Jimmy Floyd Hasselbaink took over as manager and the first time they had scored more than once at Loftus Road since 15 December. Rangers move up to 11th, 11 points adrift of the play-off places with 12 games to go. "Hopefully we can build from here. Today we were very good from back to front. From the first five minutes we had control, scored a brilliant goal and then the move for the penalty was very good. "We were able to score two goals and that gave the boys a little bit more freedom. In other games we had opportunities in the first half and didn't score, and then the other teams have started better in the second half. "To score two and have other chances against a very good side like Birmingham is very good. "I would have liked to have had more control in the second half but we had a good shape and could have scored to make it 3-0, so I am happy." "The first goal we conceded was a bit soft. Chery has had four or five touches and we didn't get near him. I also felt the penalty was a bit soft. Polter sees Morrison coming and leans into him and he goes down. "I spoke a lot to the players before the game about the mentality and what we do so well away from home, which is to be hard to beat and very hard to play against. "I don't want to take credit away from QPR, because they were good value for their win, but that 40 minutes in the first half was the poorest we've been in terms of energy and drive. "We were much better in the second half and maybe if we'd have taken one of our opportunities it would have been different. But we didn't show enough drive and desire to get anything out of the game. We looked a little bit lacklustre." Match ends, Queens Park Rangers 2, Birmingham City 0. Second Half ends, Queens Park Rangers 2, Birmingham City 0. Substitution, Queens Park Rangers. Abdenasser El Khayati replaces Junior Hoilett. Foul by James Vaughan (Birmingham City). Junior Hoilett (Queens Park Rangers) wins a free kick in the defensive half. Attempt saved. Conor Washington (Queens Park Rangers) right footed shot from the left side of the box is saved in the centre of the goal. Assisted by Sebastian Polter. Attempt missed. James Vaughan (Birmingham City) header from the centre of the box is high and wide to the left. Assisted by David Cotterill following a set piece situation. Foul by Daniel Tözsér (Queens Park Rangers). Attempt missed. James Vaughan (Birmingham City) right footed shot from the centre of the box misses to the left. Assisted by David Cotterill. Jon-Miquel Toral (Birmingham City) wins a free kick in the defensive half. Foul by Karl Henry (Queens Park Rangers). Offside, Birmingham City. Michael Morrison tries a through ball, but Clayton Donaldson is caught offside. Ryan Shotton (Birmingham City) wins a free kick in the defensive half. Foul by Sebastian Polter (Queens Park Rangers). Attempt saved. Massimo Luongo (Queens Park Rangers) right footed shot from outside the box is saved in the centre of the goal. Assisted by Conor Washington. Foul by Conor Washington (Queens Park Rangers). Attempt missed. Daniel Tözsér (Queens Park Rangers) left footed shot from outside the box is high and wide to the left. Assisted by Massimo Luongo. Substitution, Queens Park Rangers. Conor Washington replaces Matthew Phillips. Jon-Miquel Toral (Birmingham City) is shown the yellow card for a bad foul. Foul by Jon-Miquel Toral (Birmingham City). Substitution, Birmingham City. William Buckley replaces Jacques Maghoma. Attempt saved. Paul Robinson (Birmingham City) header from a difficult angle on the right is saved in the top centre of the goal. Assisted by David Cotterill with a cross. Corner, Birmingham City. Conceded by Gabriele Angella. Attempt blocked. Clayton Donaldson (Birmingham City) right footed shot from the centre of the box is blocked. Assisted by Ryan Shotton with a cross. Attempt missed. Karl Henry (Queens Park Rangers) right footed shot from outside the box misses to the left. Substitution, Queens Park Rangers. Daniel Tözsér replaces Tjaronn Chery. Corner, Birmingham City. Conceded by Nedum Onuoha. Attempt missed. David Cotterill (Birmingham City) right footed shot from a difficult angle and long range on the left misses to the right. Corner, Queens Park Rangers. Conceded by Michael Morrison. Attempt blocked. Tjaronn Chery (Queens Park Rangers) left footed shot from outside the box is blocked. Assisted by James Perch. Substitution, Birmingham City. James Vaughan replaces Maikel Kieftenbeld. Attempt missed. Maikel Kieftenbeld (Birmingham City) right footed shot from the centre of the box is too high. Hand ball by Junior Hoilett (Queens Park Rangers). Attempt saved. Junior Hoilett (Queens Park Rangers) right footed shot from outside the box is saved in the top centre of the goal. Assisted by Tjaronn Chery. Substitution, Birmingham City. Jon-Miquel Toral replaces Diego Fabbrini. Foul by Matthew Phillips (Queens Park Rangers). Diego Fabbrini (Birmingham City) wins a free kick in the attacking half.